Our hard working team of developers have now implemented a number of helpful updates and improvements in the newest version of FirstWare IDM-Portal SmartEdition. Additional attributes and the much sought after Self Service link are now standard features in version 2017.2. The latest update in FirstWare IDM-Portal SmartEdition 2017.2 has been driven mainly in response to our customer’s feedback. The ‘About’ page in the new version of the IDM-Portal includes a Self Service link which is only visible for administrators, i.e. users with an admin role. This generic link can be shared with all users of the IDM-Portal. A click on the link automatically opens the users’ profile on the portal’s Self Service page. If Windows authentification is not activated, it will prompt the user for a user name and password. This link can be published on the intranet. With just one click users can open their profile and update their own data, such as phone numbers which are directly updated in AD. 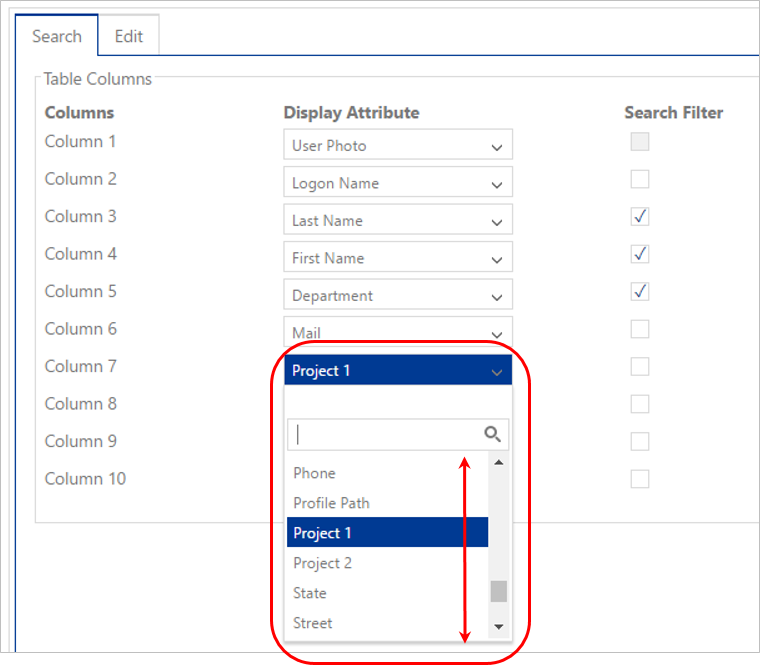 When configuring the table columns and search filters, most of the AD attributes in IDM-Portal SmartEdition are now available for selection. All together around 50 attributes can be chosen and displayed in up to 10 table columns. The tables can be specifically customised for each role. Attributes ‚c‘ (country abbreviation) and ‚otherTelephone‘ (other phone number) have been added to the configuration mask (also as search and display attributes). They can be used as values in an AD Phone Book. Quite often employees have more than one phone number through which they can be reached at their desk or within the company. Next to the primary work telephone number (‚telephoneNumber‘), the IDM-Portal SmartEdition now also includes the attribute ‚otherTelephone‘. In addition to the ‚co‘ (country) attribute it is sometimes required to add a country code to the user profile. Version 2017.2 incorporates ‚c‘ as a new attribute for country codes. With the help of a .csv file this field can include a dropdown list with the commonly used two-character country abbreviations. All these changes are driven by our customers‘ requests for better delegation of AD user management tasks and are now available in IDM-Portal SmartEdition 2017.2. The buttons at the bottom of the ‚Configuration‘ page were re-arranged to make their usage more intuitive. A new tooltip was added with helpful explanations. Tooltips are displayed when the mouse cursor hovers over the buttons (mouse over). A click on the button ‚Reset to default‘ brings up a new message box. Users are advised that label and design configurations go back irrevocably to default values. When a user with the admin role clicks on his own profile (Self Service), the user’s profile page is loaded with admin setting. In other words, instead of the restricted view of the Self Service role an administrator can see a full profile page reflecting the permissions of an administrator. The print view of a user’s profile page has also been improved. Only those fields are visible on the page which are available in the relevant role as readable and writable fields. 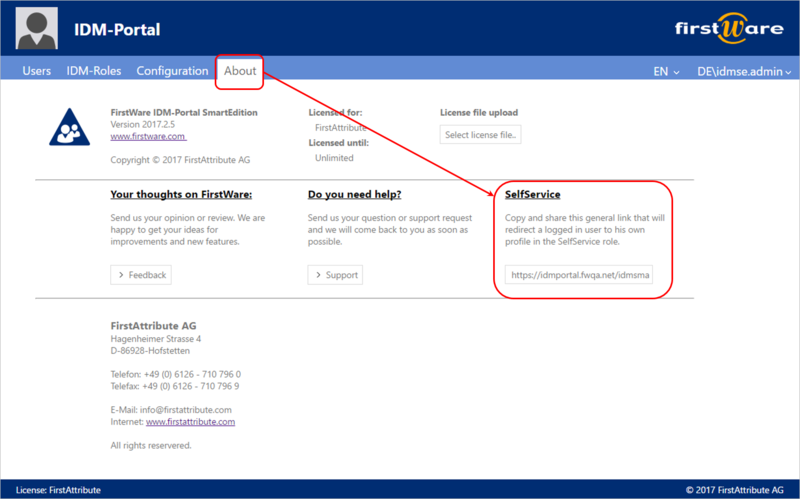 FirstWare IDM-Portal SmartEdition 2017.2 includes a number of bugfixes from the previous version. All existing FirstWare IDM-Portal SmartEdition customers will be contacted directly and receive the update automatically. Alternatively, you can download the latest version from the IDM-Portal SmartEdition website.